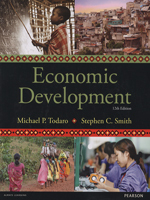 Economic Development, - the leading textbook in this field - provides students with a complete and balanced introduction to the requisite theory, driving policy issues, and latest research. Todaro and Smith take a policy-oriented approach, presenting economic theory in the context of critical policy debates and country-specific case studies, to see how theory relates to the problems and prospects of developing countries. · Policy Analysis and case studies – review great progress in many developing countries, plus big challenges such as violent conflict and climate change; insights from comparative case studies such as Costa Rica, Guatemala and Honduras.